The seeds of the roundhouse was sown back in 1978 when Charles, then 13, watched a series on the BBC called Living in the Past which followed a group of fifteen young volunteers, six couples and three children, recreating an Iron Age settlement, where they sustained themselves for a year, equipped only with the tools, crops and livestock that would have been available in Britain at that time. For years it seemed to him to be a fun thing to try, but it was only when his son Hedley had grown to adulthood and acquired many skills, including those he learned during his service with the Royal Marines (in which he featured in Channel 4’s Royal Marines Commando School) that the notion could become reality. 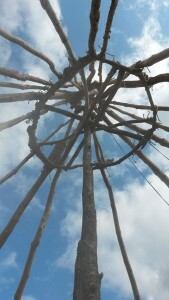 But deciding to build a roundhouse was one thing, working out the practicalities of how to do it was quite another. The reality is that there is no hard evidence of how these houses were constructed. 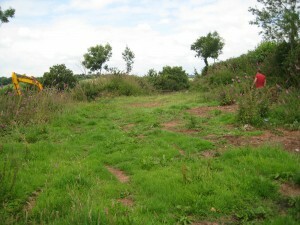 The archeological evidence is scant as all that really remains of any of the roundhouses that have been discovered are pit-holes and hearths. Others have built roundhouses before, but every construction has been their interpretation of what they think the buildings looked like, there is no right way or wrong way, and many hours were spent trying to work out how we would do it and what would or wouldn’t work. 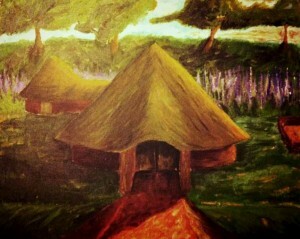 Lizzie’s impression of what the Roundhouse would look like. 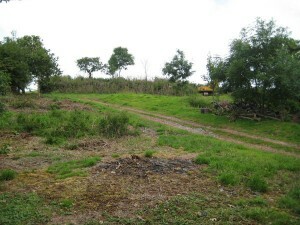 Having decided on the site, an area which in former times had been used as a “Mowplot” – where the ricks of corn and hay had been built – but in recent times an area of the farm never used but for storage and having bonfires, the area was leveled – this was done on 1st July 2014. We felt that we had the space to construct a large roundhouse with a diameter of 30’, perhaps a little ambitious, but if we were going to try build it we would do it on a grand scale. The first thing we realised is that we would have to try and remember what our Maths teachers had taught us about angles and areas, and working out lengths – things that we, as farmers, never thought we would have to use, and probably why we didn’t concentrate on those particular lessons at school! 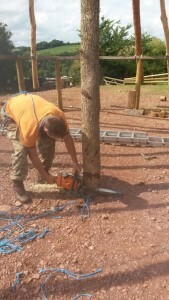 Our workings out showed us that we needed rafters 28’ in length and finding timber on the farm of the tight length, thickness and straightness proved a much harder task than we thought, as did the huge task of winching the timber up the steep hills and stripping the bark off each piece – hot work during that glorious summer. For what seemed weeks the whole family spent long days bark stripping using old hooks and billhooks – it was almost enough to make us give up with the idea. A centre point was decided upon (right in the middle of where the hearth now is) and with the aid of a rope and a sharp piece of iron a circle was drawn into the earth around which 27 posts were driven into the rocky ground and the porch uprights dug in. 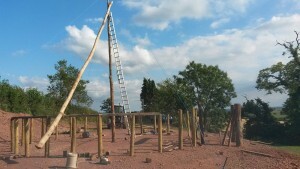 Then came the raising of the centre post, on 17th July – a long, straight elm some 30 feet high – a precarious operation which involved the whole family pulling on ropes to stop it falling one way or the other – once upright it was tied off with ropes. 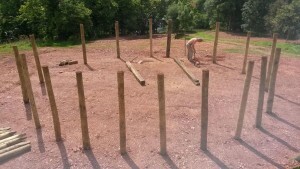 The raising of the uprights began on 27th July 2014. These are made from several woods: Elm, Ash, Oak, Nut, Sweet Chestnut, Hawthorn, and Alder. When the first few of these were tied and secured we built in two ring beans at the top of the axis. The central pole was removed from below the ring-beam – the upper-most part remains in place. 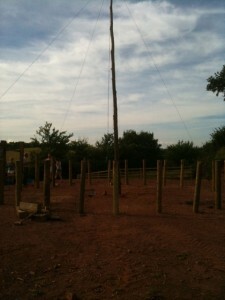 This was the moment of truth for us – would the whole thing collapse without the pole taking the weight of all the timbers? Hedley cut through it with huge trepidation, everyone else kept clear – when the cut was made the structure didn’t even move an inch – success! 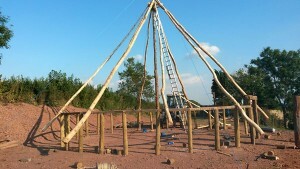 With the rings beams in place we continued putting up more uprights until all were tied in place. We then constructed the mini roundhouse for the ‘bathroom’ and the porch. The next task we turned to was building the walls. Here we deviated from tradition in that we did not weave the entirety of the walls with nut-sticks (save for the porch), as it would have meant cutting thousands of stands in mid-summer, but keen to build the walls from wood from the farm and to keep the building totally ecological we cut up various fallen trees, mostly alder, which we had a good supply of. The walls were then rendered with sand and lime. 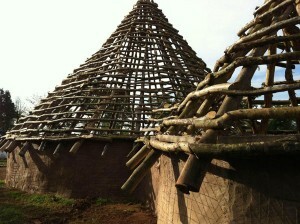 The next stage was to fix all the batoning which the thatch would lay on. For this we used nut-sticks from the hedges, a bi-product from the ancient practise of hedge-laying of which much is done yearly in the surrounding fields. 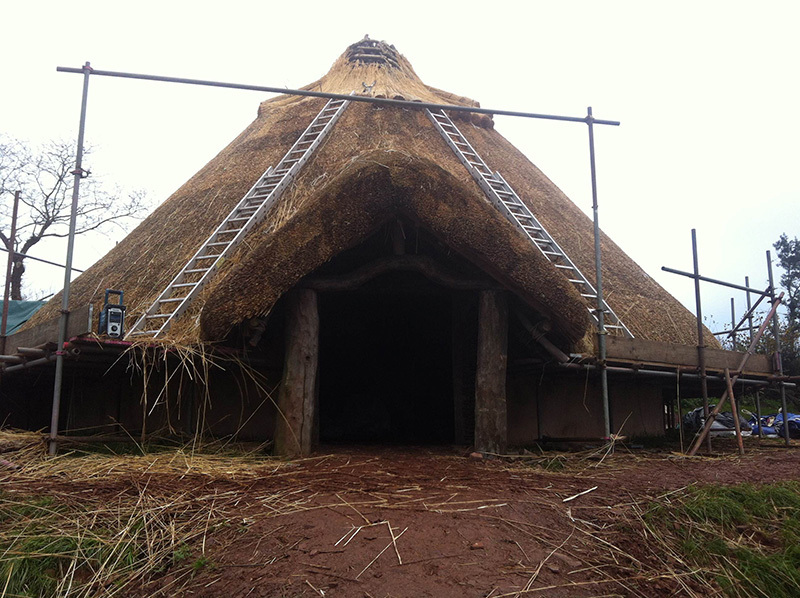 Thatching began on 25th October, the thatch being some 8 tons of water-reed, and took some six weeks work. 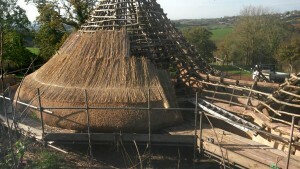 We used Alan Brimacombe from Spreyton [www.brimacombethatching.co.uk] who was amazing. He had never thatched a roundhouse before and having to thatch around the irregular roofing proved a challenge, but one he did without complaining and with excellent results, he is truly a master thatcher. He said he found the roof sturdier than many houses! 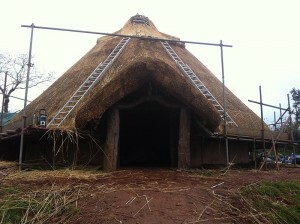 With thatching underway we could turn our attention to building the furniture. All the pieces were constructed from fallen oak from our own woods. The bed was the most challenging piece, the legs were made from a fallen tree in some steep woods and had to be carried by hand up a steep hill. The huge bed head was split from a trunk of oak, whilst the foot of the bed is made from a piece of timber which came from the ancient porch of Upcott and may well be Tudor in age, or even older. The bed can therefore be said to be a truly ancient piece, with part of it dating back over half a millenia. 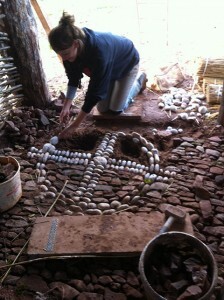 As the thatching progressed we cobbled the bathroom floor and porch, and built the hearth. 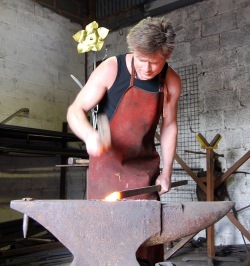 To make all the ironwork for the roundhouse, including the hearth, we commissioned local blacksmith Simon Ridley [www.devonblacksmiths.co.uk]. 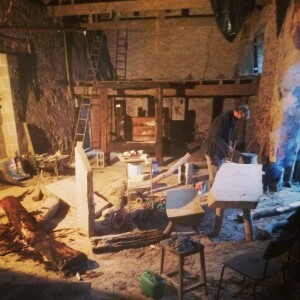 With the thatching done we were ready to light the fire in the hearth. This was a moment of great trepidation, all had told us that these two things would make our project impractical. 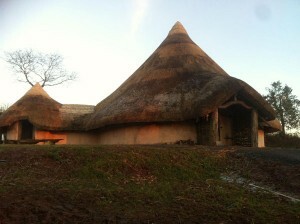 Would the whole place fill with smoke and would sparks set fire to the thatch? To prevent the latter we enlisted the help of Gary Pinnock of Thatching Advisory Services [www.thatchingadvisoryservices.co.uk] who treated the thatch with a natural fire retardant called Thatchsayf. The fire lit we were delighted and relieved to find that the smoke dispersed to the top of the roundhouse and filtered through the thatch – even though it is some 14” thick. The frightening thing was our whole project could have been one large folly had the fire smoked and we had no idea how we would have tried to surmount this problem. We would probably have had to install a stove and chimney, which we were loathe to do as this would have defeated the idea of what we were trying to achieve. 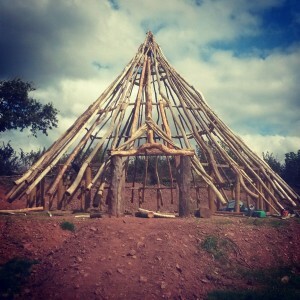 By Christmas 2014 the Roundhouse was complete, some six months after we had started it, we never dreamed that it would have taken so much work, an estimated 2,500 man-hours went into its construction. Had we known how much work it would take us we probably would never have started, it was literally built with blood, sweat and tears, but it turned out better than we could ever have imagined and gave us a profound respect for our ancestors. One appreciates how whole communities must have been involved in building such a house, especially when one realises that we purchased a mile of rope to ties it all together and this would have all had to have been made by hand originally.